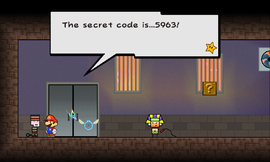 Conn is a captive held by Mimi in Merlee's Mansion in Super Paper Mario. His name may be a pun on the word con, meaning to scam someone (usually out of money). He is always seen in the room at the second floor of the mansion. Although he acts "uppity", deep inside, he really hates being alone and loves when people talk to him. He tells the heroes the passcode for the VIP generator room for 100 rubees. Later, after Mimi leaves, he says he misses teaching new prisoners "the ropes" of being one and admits to being lonely. This page was last edited on February 20, 2018, at 09:18.